The Ashram is bustling with activity as residents prepare for Amma’s arrival. Ashram residents are busy cleaning and sprucing up the premises to welcome Amma back after Her two-month Japan-North America Tour. 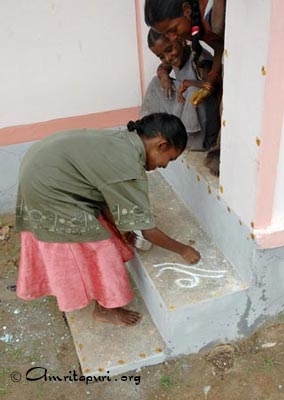 Residents can be seen painting flower pots, changing curtains, and lovingly painting flowers on the steps the Amma climbs daily. All the different sections such as the Cafe and Accommodation are busy preparing for the flood of devotees expected to pour into the ashram when Amma arrives. You may recall how Amma was front-page news in the Washington Post. The Times of India noted that Amma made more headlines in the U.S. than the Indian Prime Minister when he visited the U.S. 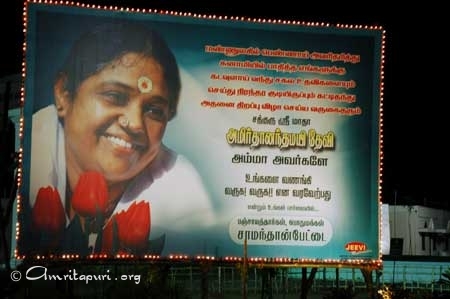 Seeing how Amma wins everyone over, no matter where, no matter who, it cannot be denied that Love conquers all. A memorandum of understanding (MoU) for Indo-US Inter-university Collaborative Initiative in Higher Education and Research was signed today during the visit of Prime Minister of India Dr. Manmohan Singh to Washington DC on July 20. In this land mark agreement six leading American universities, including the University of California campuses at Berkeley and San Diego, Carnegie Mellon University, Cornell University, Case Western Reserve University Cleveland, Ohio and State University of New York at Buffalo, which are ranked among the best universities of the world, will join with Indian institutions led by Amrita Vishwa Vidyapeetham, ISRO, and Department of Science and Technology to enhance science and engineering education in India over Edusat. Three of the leading technology companies in the world, Microsoft, Qualcomm, and Cadence, will be funding this Initiative. University leaders, corporate executives, and the Secretary of Space, the Secretary of Science and Technology, and the Indian Ambassador to the U.S all gathered last wednesday in Washington D.C. for the signing of a three-year Memorandum of Understanding, immediately following which, they were warmly greeted by Prime Minister Manmohan Singh in Blair House, across from the White House. This MoU will bring the best of American university professors to Amrita. Amrita will deploy and manage its state-of-the-art e-Learning platform for delivery of interactive multimedia enriched lectures. The Professors from these Universities will take classes for a semester or two. These classes will be aired using ISRO’s EDUSAT to over 250 professional colleges in India. The DST will design the curriculum and multimedia-rich course materials. The American universities include University of California at San Diego, University of California at Berkeley, Carnegie-Mellon University at Pittsburgh, State University of New York at Buffalo, Case Western Reserve University at Ohio and Cornell University at Ithaca of New York. The American universities would also allow these professors to use their teaching and research material and related content, and for inclusion in the digital content library being created for future use by the students. The various disciplines of collaboration include Computer Science & Engineering, Information Technology, Electronics & Communication, Manufacturing, Biotechnology and Bioinformatics, Nanotechnology, Healthcare and others. Three U.S. research centers are partners to the agreement: UC’s Center for Information Technology Research in the Interest of Society (CITRIS); the California Institute for Telecommunications and Information Technology (Calit2); and Carnegie Mellon’s CyLab. According to the most recent figures from the American Society for Engineering Education, nearly 58 percent of students enrolled in Ph.D. engineering programs in the United States are not U.S. citizens. The program will expose U.S. faculty to potential research partnerships in India, and could also promote more Indian students to gain admission into U.S. engineering schools from India. “For centers like ours that rely heavily on partnerships with global companies, globalizing our own activities is critical to sustaining the engine of innovation that we are called upon to drive. This initiative is also a living experiment in understanding the effectiveness of distance learning in an environment that is full of promise”, said Ramesh Rao, Calit2’s division director at UCSD. For its part, Microsoft India is partnering with Amrita University to set up the International Centre of Excellence in e-learning, for education, research and helping drive e-learning content. In its commitment towards driving IT education in the country, Microsoft India will be instituting a Microsoft Chair for three years at Amrita university. Amrita is the pioneering university in India to enter into such a international collaboration. This historic agreement will bring a major change in the higher education scenario in India. It will also go a long way in transforming India into a Knowledge society. It may be recalled that similar Indo-US and Indo-German agreements in the 1950s, set the stage for the development of IITs, which are now counted among the top technical institutions worldwide. Now Indian students will be exposed to the nobel laureates teaching and knowledge content of American Universities without going to USA. Amrita is already at the forefront in implementing tele-education and tele-medicine services in India. Along with ISRO, it hosts the largest tele-medicine and tele-education network in India. Amrita campuses at four locations in India, Amritapuri, Bangalore, Coimbatore and Kochi are connected via a multi-disciplinary, multimedia satellite network making it a virtual campus, the first of it’s kind in India. The Amrita healthcare campus at Kochi, South India, which houses a 1300 bed digital super-specialty hospital has earned a reputation as one of the best hospitals in Asia. Tele-medicine services are provided to over 36 locations all across the length and breadth of India to places as far as Leh-Ladakh, the northernmost tip of India to the remotest islands of Lakshadweep. Actively involved in community development activities for rural transformation, along with ISRO and leading corporates, Amrita hosts the largest satellite network of Village Resource Centers (VRC) with 10 locations. Dr. P. Venkat Rangan, Vice Chancellor, Amrita University. Deependar Saluja, Corporate Vice President, Cadence Design Systems. 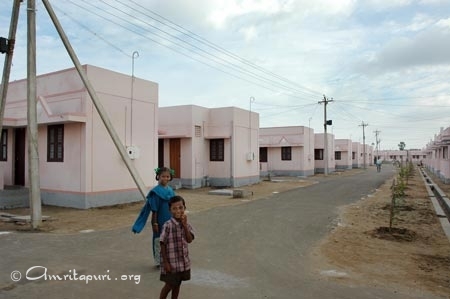 The Ashram is the first NGO in India to finish building houses, based on the government plans, for the tsunami victims. The Honourable Chief Minister of Kerala, Shri. Oomen Chandy will be handing over the keys to the houses built in Clappana village, for people of Alappad panchayat who had lost their homes in the tsunami. The ashram delegates will first present the keys to the Honourable Chief Minister. 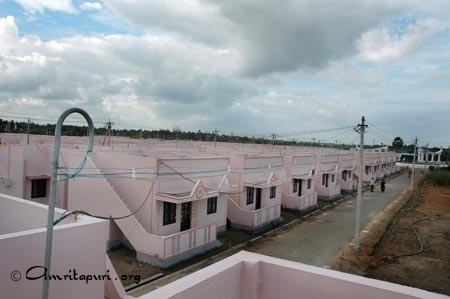 As of today Ashram has finished the construction of one hundred houses in Kerala. Construction of other houses are well underway. As part of its Tsunami Rehabilitation programme the Math had been providing driving lessons to a thousand of the local youth to provide a means of alternate employment. Shri. Babu Divakaran the Honourable Minister for Employment, will be presenting the first batch of these youth their driving license, in the same function. 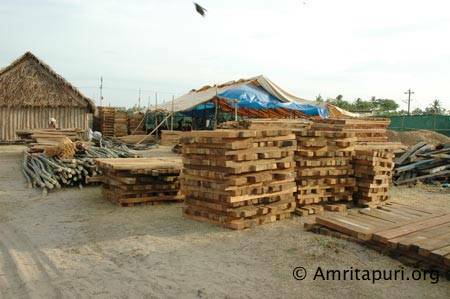 Construction of houses for the tsunami victims is progressing at a brisk pace in Samanthampettai, Nagapattinam District. 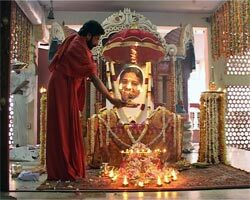 The government of Tamil Nadu initially allotted seven acres of land for the Ashram to build houses upon. 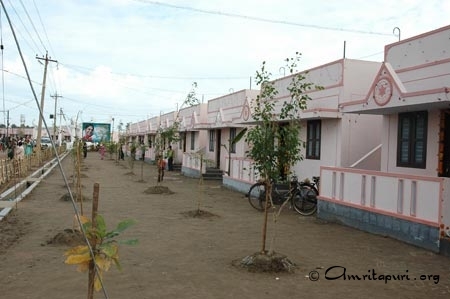 Here the Ashram is building a self-sufficient colony consisting of , community hall, a day-care centre, roads, water supplies, a playground and a market area. Isolated column footing work for 130 houses is complete. Concrete work for 35 houses is complete. More 500 people are working for the construction. 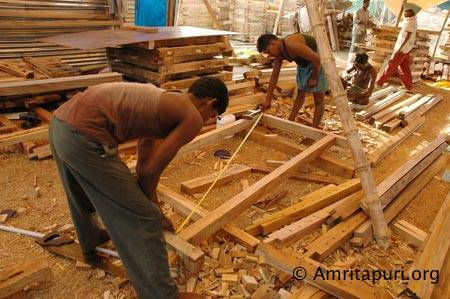 This includes 40 carpenters who fabricate 50 to 70 doors and windows daily. Water for mixing concrete is brought in tankers from a place eight kilometres away. Sand is also transported from a spot more than 70 kilometres away. Metal is brought from an area nearly 190 kilometres away. Two concrete mixing machines and machines for making hollow bricks have been installed. A full-fledged kitchen is functional on site providing three meals a day for the workers. Drinking water has also been made available using hand pumps. The president of India, Dr. A.P.J. 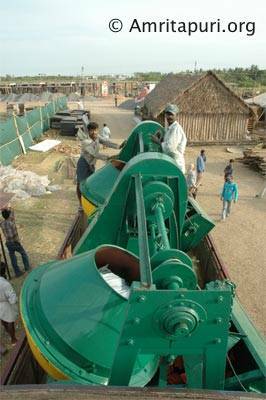 Abdul Kalam, visited the Samanthampettai construction site in Nagapattinam on 30 June 2005. 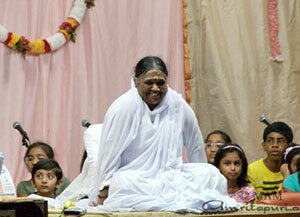 He expressed his happiness at the progress of work and complemented the efforts of the Ashram. 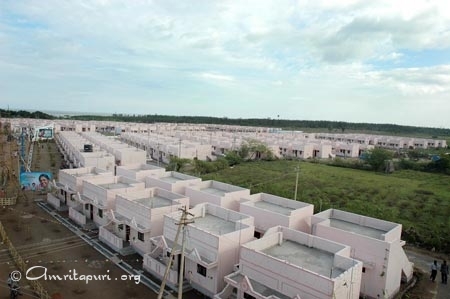 Incidentally, the Ashram is the only organisation to start tsunami-relief housing construction in Nagapattinam. The Tamil Nadu Government had allotted three acres of land for the rehabilitation of tsunami victims in Pudukuppam, Cuddalore. 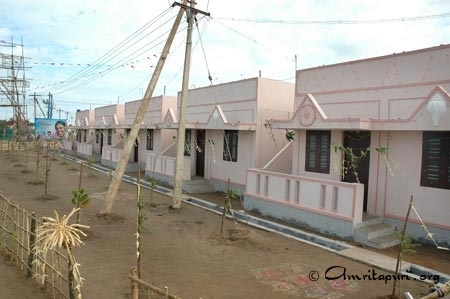 Ashram is building a total of 88 houses in this village and another 14 of which are in the properties of the recipients. This village witnessed the highest number deaths in the Cuddalore district. 101 lives were lost from 350 families at Pudukuppam. In addition to the houses, the colony will also have a community center and day-care centre. Construction is progressing well since the foundation stone for the houses was laid on 20 May. Isolated column footing work for all the houses is complete. 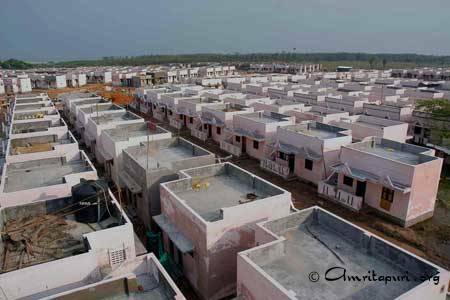 Concrete work for 72 of the houses in the site is complete. More than 400 people are working at the construction site. Bricks necessary for the construction are made at the site. 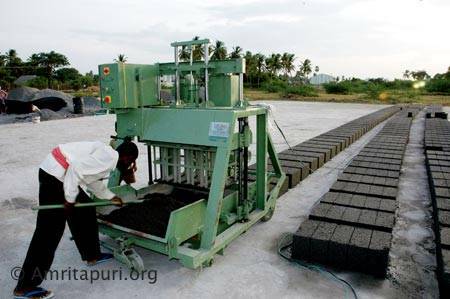 A team of workers produce as many as 2,500 bricks a day. The site also houses machines for carpentry and steel work. Work starts as early as six in the morning. The workers take a break at 11 a.m. since the temperature during daytime is very high. The temperature may even rise up to 45 degree celsius. After tea, the work resumes at four in the evening again and goes on till 12 at night. Food for the workers is cooked and served at the Ashram kitchen situated at the construction site. Using hand pumps, pure water for drinking and construction is taken from a depth of three meters. 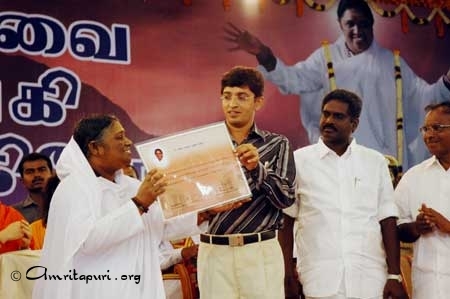 6 July 2005, Ettimadai, Coimbatore. In a packed colourful function attended by over 4000 people plus hundreds of people at 9 centers, the President of India, His Excellency, Bharat Ratna, Dr. APJ Abdul Kalam launched the Amrita ISRO (Indian Space Research Organization) joint initiative in ‘Village Resource Centers’ on 6 July, 2005 at the Ettimadai campus of Amrita Vishwa Vidyapeetham. Governor of Tamil Nadu, Shri Surjit Singh Barnala, Tamil Nadu Education Minister, Shri Shanmugham, Dr. G. Madhavan Nair, Chairman of ISRO, Brahmachari Abhayamrita Chaitanya, Chief Operating Officer of AMRITA Vishwa Vidyapeetham and Dr. P. Venkat Rangan, Vice Chancellor, Amrita University were also present on the dais. More than 25 CEOs and senior executives from leading IT and Financial Services Companies also attended the launch. “Science needs direction from spirituality. 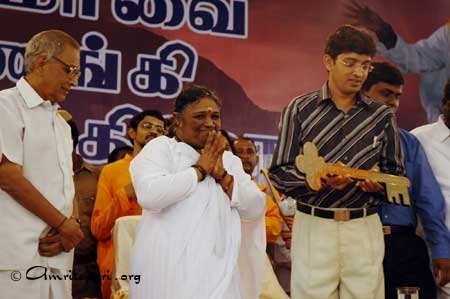 While we accomplish immense growth in computer education and Internet experimentation, we should not forget the truth that that it is spirituality that teaches us how to use knowledge with discrimination”, said Amma. In his speech for students, Dr. Kalam said, “Amrita University has a major role to play in transforming our society into a knowledge society through it’s unique value-added education system”. He also added that he was happy that the Amrita ISRO VRC’s had a mission of taking space technology and knowledge products from the University directly for communities at the grass root level like fisheries and agriculture. He also emphasized on the need to establish Village Panchayat Knowledge Centers to empower villagers. He also asked the students to repeat with him, learning gives creativity & creativity leads to thinking, thinking provides knowledge and knowledge makes you great. Earlier, Vice Chancellor Dr. P. Venkat Rangan welcomed the gathering. Shri Barnala released the brochure of the new venture. Dr. Madhavan Nair gave a brief overview on the latest initiatives of ISRO. He also commended the support provided by Amrita in implanting tele-medicine and tele-education services across India. Incidentally, Amrita Institute of Medical Sciences hosts one of the largest tele-medicine networks in India connecting to over 36 remote rural hospitals as far flung as Leh-Ladakh. In two years it has already done over 800 tele consultations and 250 CME programmes seminars and conferences including a heart surgery and kidney conference. Tele-education partners, Balu Doraiasamy, (Hewlett Packard), N. Lakshmi Narayanan (Cognizant), Sudev Muthyah (Microsoft) and Ranajoy Punja (CISCO) announced their support and participation in this Amrita ISRO rural development project. Likewise Tele-Medicine project partners Krishna Dhawan (Oracle) and Ketan Sampath (Intel); Tele-agriculture partner, Tele-fisheries partner Harishankar (IL & FS) announced their intent to participate. Shri K. Dinesh, Co-founder and Director –Infosys and MD of Ashraya Hasta announced support for the Disaster Management service of the VRC. 10 Amrita VRCs spread across 2 states were live and their interactions created quite a flutter. The Tele-education demo by Kozhikode Amrita Vidyalayam principal, Shobha Gopala Krishnan was superb. Amma’s message send from Dallas, USA for the launch of Amrita-ISRO VRC network launch. 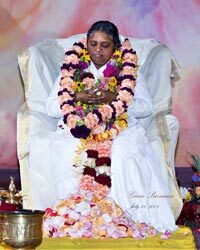 Amma bows down to everyone, who are the embodiments of pure Love and the Supreme Self. Amma is pleased to learn that the inauguration of the AMRITA ISRO Village Resource Center is being conducted in the esteemed presence of the Honourable President of India. It makes Amma’s heart full just to think that today, the villages of India are on the path of development. India’s growth lies in the growth of her villages. Yet, when we work with the intent of improving our villages, it is essential to realize that we should not spoil their pristine beauty. This beauty is inherent in the innocence and simplicity of the villagers and the customs and traditions they have been following for generations. Just as it is our responsibility to modernize our villages, we should also see it as our duty to carefully preserve the charm that our culture lends them. Education is not just to increase our brainpower. It should also have the capacity to touch and awaken our hearts. Amma has heard a story about computers in the future. In the future, there will be this computer that runs 24 hours a day, and it will be operated by a man and a dog. The man’s job will be to feed the dog and the dog’s job will be to stop the man from touching the computer! Though this is just a humorous anecdote, it contains a hidden warning, too. Although any kind of knowledge first begins as a means to benefit humanity, as time goes on, man’s selfishness gradually brings it to its destruction. When we accomplish immense leaps in computer education and Internet experimentation, we should not forget the truth that it is spirituality that teaches us how to use knowledge with discrimination. Only man has the power to turn good into evil and evil into good. In this age, when computers and the Internet are becoming more and more prominent on the education scene, we should give our students the capacity and discrimination to distinguish between good and evil. Amma prays to the Paramatman, Supreme Being that the program organized here today may become successful in achieving this goal. Srayikkad: Srayikkad in Alappad Panchayat of Kollam district: Tsunami affected costal place in Kerala where 142 people lost their lives. Located in the rural settings, at a distance of 150 kms from Cochin, medical and psychatric consultancy is the need of the hour for the local population. 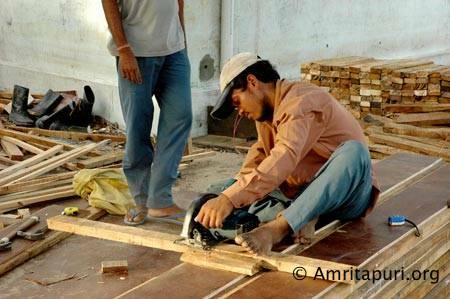 For the last 6 months, Amrita has been engaging in extensive relief activity in the region. The Amrita – ISRO VRC at is offering psychiatric and medical consultations to women, children and other affected people with the medical doctors, Psychatrists and specialists at AIMS, hospital. This facility also supports the fisherman community substantially by providing them the right information to enhance the fishing productivity. The GPS enabled fishing boats helps them to navigate and reach the zones specified by the VRC services. 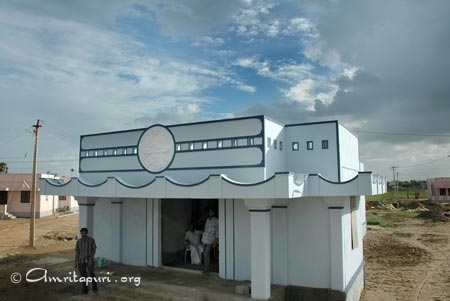 Nagapattinam: VRC has been setup in Nagapattinam when thousands lost their lives in the recent TSUNAMI. This facility supports the fisherman community substantially by providing them the right information to enhance the fishing productivity. The GPS enabled fishing boats helps them to navigate and reach the zones specified by the VRC services. Amrita Kripa Charitable Hospital, Amritapuri: 20 bed charitable hospital providing free medical care to nearly 30,000 people of coastal belt in Kollam district. Specialized medical care is virtually non-existent for the rural masses. The villagers have to travel more than 13 kilometers for operations. The Tele-medicine of the Amrita –ISRO VRC enables to provide specialized medical care from the AIMS hospital at Kochi. Amrita Kripa Charitable Hospital, Kalpetta: A charitable hospital located in Wayanad, one of the most underdeveloped and tribal districts of Kerala providing free medical treatment and medicines. Basic and specialized medical care is virtually non-existent for the rural masses and Tele-medicine of the Amrita –ISRO VRC enables to provide basic and specialized medical care to be provided from the AIMS hospital at Kochi. Amrita Vidyalayam, Orphanage Paripally: A higher secondary Orphanage School imparting education to nearly 2500 students in Kollam district, Kerala. The Amrita –ISRO VRC at this center acts as a Tele-education facility that helps students to develop skills by getting specilaized training on communication skills and presentation skills from the classes of the competent faculty from the Amrita School of Business of our Coimbatore campus. 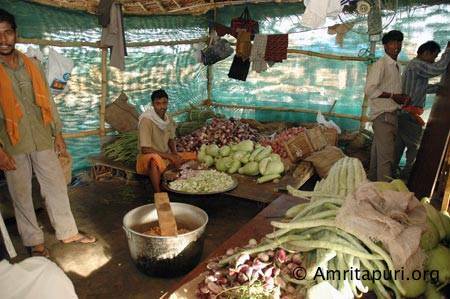 Amrita Vidyalayam, Puthiyakavu: Act as a local hub for providing training and information for the local populace on opportunities and marketability of the local products. Amrita Vidyalayam, Mananthavady: Amrita Vidyalayam located in the hill station of Wayanad, is a nodal centre for delivery of various tele services including education, medicine and agriculture. Situatated in a Agricultural geographical environment the inputs on under ground water resources, soil pattern and other critical information are vital for the farmers. These consultations would be provided from the School of environmental Sciences of Amrita University through the Amrita –ISRO VRC Center. 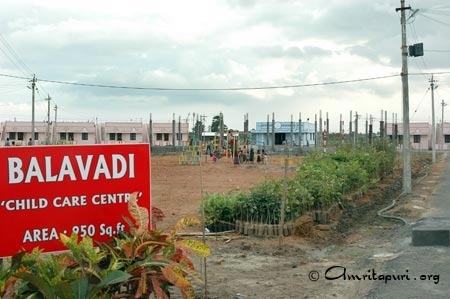 Amrita Vidyalayam, Ettimadai: Rural village with a total population of nearly 10,000 people were the VRC can act as a catalyst for employment generation and economic development. AIMS, Kochi: Amrita Institute of Medical Sciences, Kochi, a 1,300 bed super specialty hospital acts as the expert centre for tele-health care services to a remote places like Lakshadweep,, Leh, Andaman and Nicobhar Islands, Sabarimala and many other such locations. 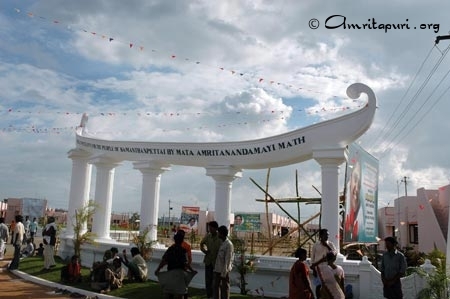 Amrita Vishwa Vidyapeetham, Ettimadai, Coimbatore: With the objective of education for achieving societal transformation, Mata Amritanandamayi Math started an engineering college in Ettimadai, Coimbatore in 1994. Now this has grown into a network of higher educational institutions offering courses in engineering, information technology, management, medicine, nursing, dentistry, biotechnology, pharmacy, journalism and visual media studies. 2 years ago, the Deemed University status was conferred on Amrita. The University campus at Ettimadai will act as the expert center for providing tele-education.